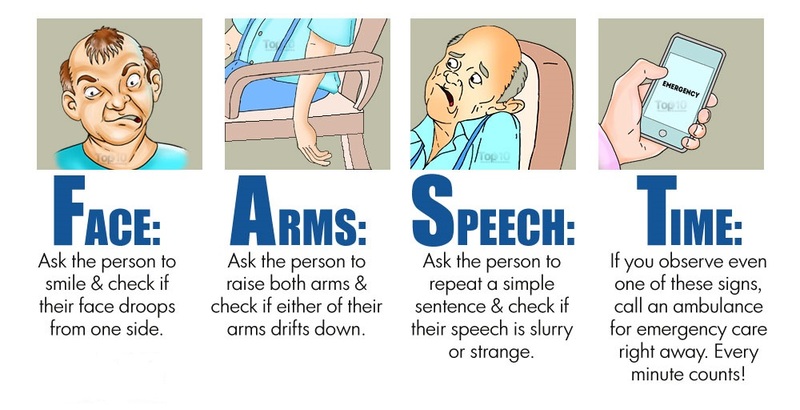 Knowing the signs of a stroke is the first step in stroke prevention. A stroke, sometimes called a “brain attack,” occurs when blood flow to an area in the brain is cut off. The brain cells, deprived of the oxygen and glucose needed to survive, die. If a stroke is not caught early, permanent brain damage or death can result. Ischemic stroke is similar to a heart attack, except it occurs in the blood vessels of the brain. Clots can form in the brain’s blood vessels, in blood vessels leading to the brain, or even in blood vessels elsewhere in the body and then travel to the brain. These clots block blood flow to the brain’s cells. Ischemic stroke can also occur when too much plaque (fatty deposits and cholesterol) clogs the brain’s blood vessels. About 80% of all strokes are ischemic. Trouble with speaking and understanding.You may experience confusion. You may slur your words or have difficulty understanding speech. Paralysis or numbness of the face, arm or leg.You may develop sudden numbness, weakness or paralysis in your face, arm or leg, especially on one side of your body. Try to raise both your arms over your head at the same time. If one arm begins to fall, you may be having a stroke. Similarly, one side of your mouth may droop when you try to smile. Trouble with seeing in one or both eyes.You may suddenly have blurred or blackened vision in one or both eyes, or you may see double. A sudden, severe headache, which may be accompanied by vomiting, dizziness or altered consciousness, may indicate you’re having a stroke. Trouble with walking.You may stumble or experience sudden dizziness, loss of balance or loss of coordination. The main stroke symptoms can be remembered with the word F.A.S.T. Time – it’s time to call doctor immediately if you notice any of these signs or symptoms. It’s important for everyone to be aware of these signs and symptoms, particularly if you live with or care for somebody in a high-risk group, such as someone who is elderly or has diabetes or high blood pressure. If one is available, knowing the address of the hospital in your area with a designated stroke center is helpful. Having a stroke increases your risk for another one. The best treatment for a stroke is prevention.